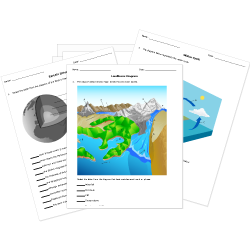 Investigate the planet Earth with these assessments on its structure, processes, and resources. Earth Science activities include rock classification and diagramming the rock cycle. Don't see a printable you need? Make your own test or worksheet that fits your needs. Browse earth science questions or use our advanced search to find existing questions while filtering by grade levels and keywords. You can also create your own questions. Three Types of Rocks new! What Is a Fossil? new! Impacts of Human Activities on Earth's Resources new! Evaluating a Science Graphic - Recycling new!